Removable shoulder strap, belt loop. Where we collect an item from you, we reserve the right to recover the costs of collection from you. Color: Black. Adjustable shoulder strap and belt loop. Good quality lightweight durable design soft case. Black/Red Case For Sony A6000 / RX100 II / DSC-RX100M2 / NEX-5T / HX60. Black EVA Protective Headphone / Earphones Carry Case And Cover W/ Netter Pocket. Aluminium Binocular Tripod for Celestron TRAILSEEKER 8X42 | SGODDE 16 x 52 kourosh8907(270). 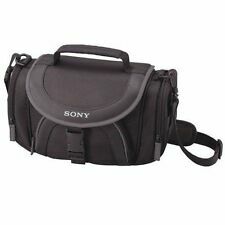 New listingOEM Sony LCS-U5 Carrying Case for Handycam Camcorders and others. NEW! Compatible with, but not limited to: Sony HDR-PJ620 Handycam with Built-in Projector / Sony HDR-PJ410 Handycam with Built-in Projector / Sony HDR-CX405 Handycam Camcorder. Also, if required, an included internal removable Velcro divider can be used for customisable storage, so you can adapt the case to suit your individual needs. 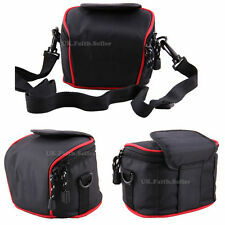 Light-weight padded shoulder camcorder case. Where we collect an item from you, we reserve the right to recover the costs of collection from you. Two side mash pocket. Color: Black. 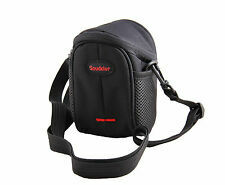 Soft padded shoulder camcorder case. Large opening for main pocket, easy to pick up camcorder for quick record. Adjustable padded shoulder strap. Where we collect an item from you, we reserve the right to recover the costs of collection from you. The listed image is for reference only. We try our best to show it as it is. But, the item you will get is the final standard. How can we get that?. We will send back the item after the repair. HC-X920M; HC-V270; HC-VX980; HC-VX980M; HC-WXF990M; HC-WX970M; HC-WXF990; HC-WX970; HC-V770M; HC-W850; HC-VX870; HC-V100; HC-X920M; HC-V500; HC-v720; HC-V10; HC-V100; etc. Adjustable shoulder strap included. Color: Blue. Belt loop and adjustable shoulder strap included. Material: Water resistant Nylon. Material: Nylon. Where we collect an item from you, we reserve the right to recover the costs of collection from you. Belt loop and adjustable shoulder strap included. Where we collect an item from you, we reserve the right to recover the costs of collection from you. 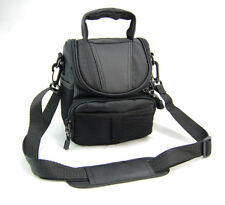 Adjustable Shoulder strap include, Belt loop. Where we collect an item from you, we reserve the right to recover the costs of collection from you. Twin side pocket, for small accessories quick use. Adjustable Shoulder strap include, Belt loop. Thick padded provides protection against squeeze / shock. Where we collect an item from you, we reserve the right to recover the costs of collection from you. 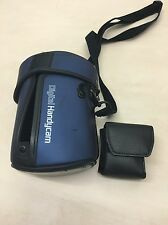 SONY HANDYCAM SOFT CASE WITH SHOULDER STRAP, 2 SIDE POCKETS, 1 FRONT POCKET, 2 INTERNAL COMPARTMENTS AND A REMOVABLE TOP SHELF, 14in WIDE WITH SIDE POCKETS, 9in TALL WITH CARRY HANDLE, 8in DEEP, IN AS NEW CONDITION WITH SOME STORAGE MARKS, AS PHOTOS, GOOD LUCK. Removable divider, easily to customize space. Light-weight durable design camcorder case. Well padded with foam, protect camcorder from squeezing and collide. Adjustable shoulder strap. Soft sleeve like case in grey for Sony Handycam camcorders. Includes strap and area for putting the battery. Thick padded heavy-duty shoulder camcorder case. Material: Nylon. Where we collect an item from you, we reserve the right to recover the costs of collection from you. 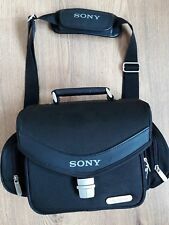 Sony Camcorder Handycam Shoulder Carry Case Bag . Bag is in good condition with some minor signs of wear. Go od c on di ti on ca se f or so ny h an dy ca m, be lt m ou nt w it h ma gn et ic l id. Adjustable shoulder strap and Weather proof cover include. Sony Handycam Case Cover. Condition is Used. Dispatched with Royal Mail 2nd Class. Material: Waterproof Nylon. Where we collect an item from you, we reserve the right to recover the costs of collection from you. Semi-soft carrying case. Battery case. Unused great condition - unwanted gift. One side pocket and a nylon belt on another side used to hang a extra external pocket. Mash pocket on flip over cover. Where we collect an item from you, we reserve the right to recover the costs of collection from you. Material:Waterproof Nylon. Adjustable Shoulder strap include, Belt loop. Twin side pocket, for small accessories quick use. Where we collect an item from you, we reserve the right to recover the costs of collection from you. Water resistant canvas digital camcorder case, protect camcorder from scratch, shock and light shower. Adjustable shoulder strap include. Where we collect an item from you, we reserve the right to recover the costs of collection from you. 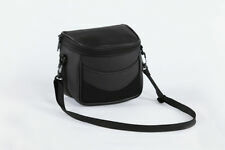 Lightweight shoulder camcorder case / handbag. Removable padded shoulder strap. Features: Padded Strap. Material: Nylon & Leather. 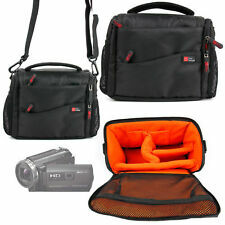 Sony Handycam Video 8 Carry Case Bag Only. Bag is empty but contains a shoulder strap that looks unused. CASE KIT FOR SONY HANDYCAM LCM-TRVA. FITS DCR- TRV33/TRV22/TRV19/TRV14/TRV12. DCR- TRV33/TRV22/TRV19/TRV14/TRV12. We do NOT accept non sterling cheques/money orders. The case fits the following camcorders. Adjustable shoulder strap included. Color: Black. 24cm x 14cm inside bag.